Fiber art has always been a part of my life. Whether it is basketry, weaving, spinning, knotting or another form of fiber art, I love the tactile sensations of fibers and feeling the life within them. I am known for the fishbone baskets that I weave with fish bones and monofilament, and also my knotted waxed linen sculptures that I create. My sculptures of knotted waxed linen are derived from my emotions within and personal feelings about life. I knot waxed linen over a form that best expresses my emotions until they make me feel good; until I feel they express what I want. 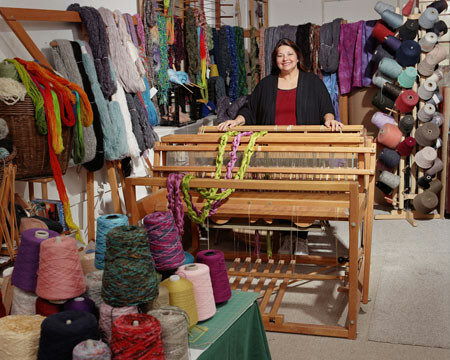 I have exhibited nationally and internationally and have been the recipient of many awards in fiber art.